Anxiety, Depression or in need of a friend? “Anxiety, Depression or in need of friendship? You cannot have failed to notice the high levels of focus in the media on the issues of Mental Health. 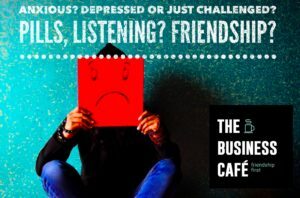 This is such a brilliant subject to be highlighting, as you know, we within The Business Cafe, mental health as a large agenda in our culture. It is our highest intention to help self employe d and small business owners to maintain the strong mind to build a strong business. My Thought for Today has been on my mind for a few weeks, knowing how to articulate what is in my thoughts and ensuring that are delicately addressed is my challenge, I think todays thought is a discussion, I cannot profess to have the answers, I can only talk from my own experience and wonder what you all think of this topic. So, controversially, but perhaps common among many of us, I was brought up to ‘deal with things’, ‘chin-up’, spend lonely time in my bedroom resolving my own sadness. This has many benefits and some disadvantages; I am amazingly resilient, hugely tenacious, very un-needy. But, I have also been very lonely in my head, found it hard to express emotional pain to others and perhaps too independent. I have grown up being told, ‘you are too sensitive’, therefore seeing my sensitivity as a weakness, adapting and accepting the insensitivity of others. Then aged 51, I grew up, I decided not to accept the insensitivity of others, I realized my emotional state or kindness and sensitivity was a strength. I also decided to realize that some of my joy had left me, my anxiety was not normal, and I reached out for help. I was not depressed, but I was suffering the symptoms of anxiety and over 10 years of trying to ‘deal’ with some fairly major losses, financial challenges and hard work accompanied with not enough sleep was not going to be sorted by my own internal skills. So, I relate to the Mental Health agenda and I welcome it. I also recognise that life is not meant to be a walk in the park, not everyday can be full of joy, we become stronger and more likeable though our adversity, and basically, we are all animals and it is normal to have to hunt for food, protect our families, have an element of fear and scarcity and keep on keeping on. It has always been thus. In modern life however, what is missing for many of us are the tribal element of being an animal or a cave man, knowing others are also watching our back and care about us. We are so busy, focused and now often sitting in our homes rather than in groups at work, we have few spontaneous moments to share the ups and downs of our days, so they can sit inside our heads. We also rarely hear other people’s ups and downs. So this brings me to wonder, how much of our internal dialogue and worries could actually be solved by knowing we are normal. That it is normal to have rough days, to have moments of scarcity, to suffer loss. Can a lot of our mental states be solved by knowing that everyone else around us also have issues and that together, with listening ears, loving hugs, friendships and openness can stop us from accelerating into full-blown anxiety and perhaps depression. To me, the greatest thing I can create is to reduce my business loneliness and to surround myself with good people, to create an open community that allows others to talk openly and to build their personal self-esteem and worth. Understanding mental health is so important, we know now it is as important as our physical health and we know that we can keep fit and eat well and increase our immunity, but occasionally we need the help of medicine and experts. This is the same for our mental health. My controversial thought, and fear, is that through all this highlighting of mental health, is this going to create a nation of workers that turn to pills in the same way that we turned to antibiotics? Shouldn’t we learn to strengthen our minds, not weaken them with pills? Just like antibiotics, we need to resort to pills in extreme circumstances and embrace the mental challenges of life with the same attitude that we should embrace a cold, build our immunity and thank each day for each challenge that makes us stronger. Too often I hear people saying “I have anxiety’, “I am depressed”, throw away comments that are actually being used instead of saying ‘this is worrying me’, or ‘I feel a bit low today’. Anxiety and Depression are very serious, we should not use these phrases lightly, saying it, places the wrong mindset in our heads. much like saying “I have flu” when actually we have a sniffle! Over to you all, can friendship, love, community and openness help us all have a stronger mind, reduce loneliness build our resilience? And when should be know we actually need pills and therapy?